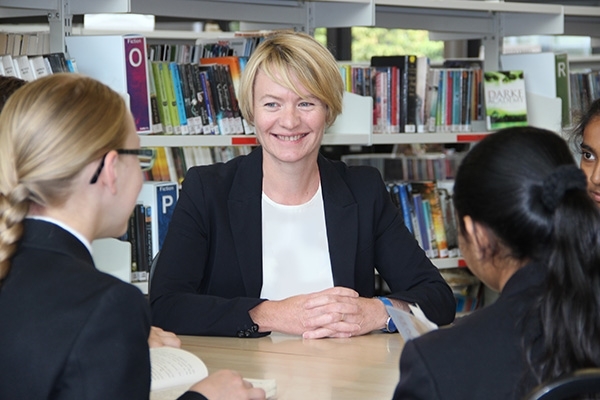 I am very proud to be the Headteacher of Dormers Wells High School. We are a mixed community comprehensive school in the London Borough of Ealing dedicated to serving our locality. All visitors to our school notice how proud the students and staff are of their school. They notice how well the students behave in this very friendly and high achieving school, and how smart they appear in their school uniform. Our vision is to empower students so that they are able to take control of their own future and have enhanced life chances as a result of learning with us. We have very high expectations for the achievement of all of our students at Dormers Wells High School. Our latest Ofsted report validates this sentiment with the school continuing to be judged as securely Good. However, the real measurement of a school is not in its building or resources. It is about the strength and effectiveness of the people who belong to its community. Our 2015 Ofsted inspection stated students are proud of their school. At the heart of everything we do are our students. Our curriculum is student-centred and we aim for their education to be inspiring, stimulating and challenging. Our students’ results in mathematics placed us in the top 2% per cent of schools nationally for progress made from KS2 to KS4 and humanities is in the top 3% nationally. We encourage and nurture a ‘growth’ mindset in all members of our community; this ethos is supported by our flexible curriculum, which enables our students to make rapid progress. As Ofsted stated: “The atmosphere is calm and orderly. Pupils have high aspirations and work hard”. Our staff members, both teaching and support, are a dedicated and highly professional team with a genuine interest in the psychological and physical well-being, and development of each and every student. Our pastoral care systems ensure that the students are provided with every opportunity to realise their full potential. It is well known that the staff, students and parents of DWHS work in close partnership to ensure that all the necessary ingredients are in place to meet individual needs. We know from our own experiences what difference teachers make to the progress of the students. That is why staff development is given the highest priority at DWHS. Our extensive training programme is based around the Dormers 9, which gives us a common language about the delivery of great teaching and learning. We also have a provision for students with a hearing impairment, which enables these students to be fully integrated into the main school curriculum and extended school activities. A browse through this website will give you a virtual sense of the wonderful experiences provided for our students and examples of their many achievements and accomplishments. However, I encourage you to visit us in person when you will be greeted by well-presented, articulate, competent and courteous young people, and a highly skilled and welcoming staff team. As soon as you step through the front door and into the reception area you will realise that you are in a real and special centre of excellence.